What is True Cellular Detoxification? Think of your body as a bucket. Now imagine the toxins that surround us in daily life are the liquid that slowly fills that bucket. With each toxic exposure, drop-by-drop, your bucket becomes more full. A drop here and there isn’t such a big deal; however, chronic exposure to an onslaught of chemical, physical and emotional stressors fills up your bucket each day, and at some point the bucket begins to overflow. It may take a few decades before your bucket spills over, but once it does, cellular inflammation is triggered and unwanted symptoms arise. 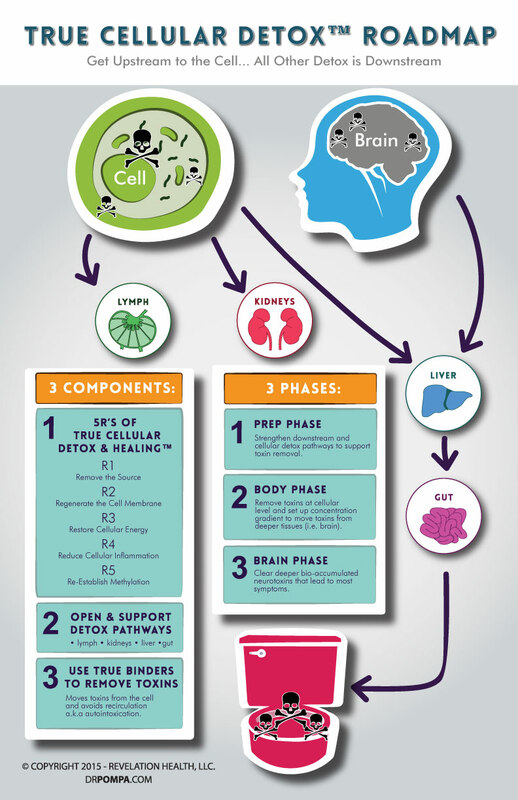 The True Cellular Detox™ process begins by determining which sources of stress may be causing body-wide damage and supporting the body’s natural ability to remove them. Removing the toxic source that has accumulated over time in the body is essential to getting results, and can be where health restoration begins. True Cellular Detox™ supports the body’s natural ability to detox, which can help you realize your greatest level of health. Direct one-on-one interactive sessions with Dr. Daniel Pompa and Ben Greenfield, to walk you step by step through each component of the True Cellular Detox™ program, and to answer questions. Insider Access to the exact detoxification protocol Dr. Pompa & Ben Greenfield will be following as they go through the program along with you. This protocol includes personal exercises, biohacks, recipes and much more! Goto www.TrueCellularDetox.com and enroll with the voucher you recieve when you purchase the program and supplements from our office. Goto www.VCStest.com to take your visual contrast sensitivity test to see if toxins are affecting your vision. Vision is the best window to assess the risk of neurotoxicity and functional loss of the brain. Fill out our neurotoxicity questionaire. Having a score less than 50 indicates a low risk of toxicity. Having a score over 50 and into the 100 is a moderate risk of toxicity. If you are over 150 then you are at severe risk of toxicity. Take the Meta-Oxy test with a sample of your urine to test for cellular damage and risk of toxicity to the cellular membrane that is compose of fat. The test reacts with aldehydes that come from cellular breakdown from the cellular fat membrane indicating oxidative stress. This tells us if you have cellular break down and how much on a scale of 0 to 7.